Wolfgang Amadeus Mozart (1756-1791) is one of the giants of classical music and it is my considered opinion that anyone who claims to love music should at the very least be acquainted with his work. Even in his short life Mozart was amazingly prolific across many of the sub genres under the general heading of “classical music”. One good place to start is at the end with his final, unfinished masterpiece, Mozart’s ‘Requiem’. If you have seen Peter Schaffer’s Amadeus you will know one version of how it came to be commissioned and composed although Malcolm Archer’s helpful notes in the comprehensive CD booklet are probably closer to the truth than the movie. Archer does, though, explain why he has preferred Franz Xaver Süssmayr’s edition along with some other key decisions facing any conductor who wants to tackle the piece. Recommended reading! However what we really need to know is how it all sounds. The brief review is, pretty good. Winchester College Chapel Choir is a unique group of young singers who perform to the highest standards. Winchester College is the only public school in the land that has retained its ancient Choral Foundation, that is a Collegiate Choir with choristers (called Quiristers) who sing daily and receive generous bursaries for their services. This Oxbridge model has ensured professional musical standards, backed up by an excellent academic education. The alto, tenor and bass parts are sung by singers in the 16-18 age range, many of whom go on to choral scholarships in University College choirs. 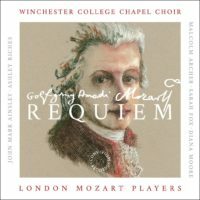 The professional soloists, Sarah Fox (soprano), Diana Moore (alto), John Mark Ainsley (tenor) and Winchester Old Boy Ashley Riches (bass), are all in excellent voice and along with the London Mozart Players give as good as they get. A quick look in my preferred guide to classical music tells me that there is a plethora of recordings available, all following a slightly different approach and many featuring world famous soloists and conductors. It seems almost unbelievable to suggest that what is basically a school choir with guest soloists can stand in such exalted company but under Malcolm Archer’s assured direction we get another worthy addition to the catalogue. My only quibble is that the programme lasts a mere 48 minutes. Archer has, rightly in my opinion, decided on a brisk tempo throughout without ever sounding hurried but in this day and age I see no reason for any CD release to come in at under an hour. Given the glories of Mozart’s CV and the talent available at the recording session surely it should have been possible to give us a few more minutes. But please do not let this put you off investigating what is a fine new recording of one of the all-time greats of the sacred choral repertoire, beautifully sung.